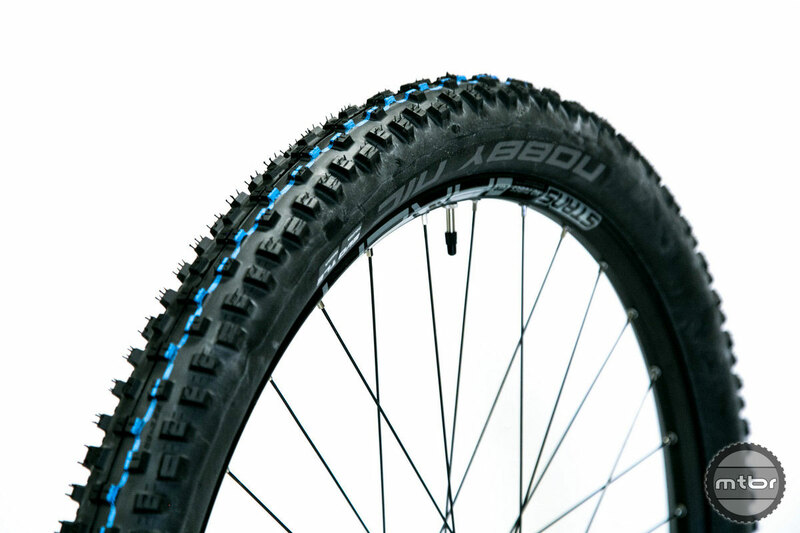 The Schwalbe Nobby Nic is one of the most popular trail tires, earning OEM spec on many trail bikes. The Schwalbe Nobby Nic has a difficult job: Deliver great grip and durability while minimizing rolling resistance, and also provide good braking performance. Such is the life of a trail tire. It’s most often used for everyday rides, but may also be called on to do an XC race or some technical, steep descending. 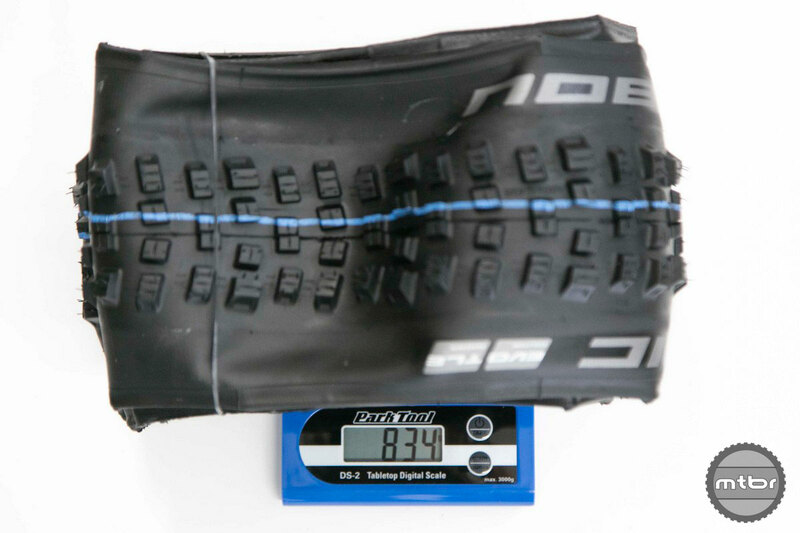 Mtbr tested the 29×2.35 version with 67 tpi and a claimed weight of 765g. Actual measures were 834g and 2.4″ wide when measured on Stan’s Arch MK3 wheels with 26mm internal diameter. 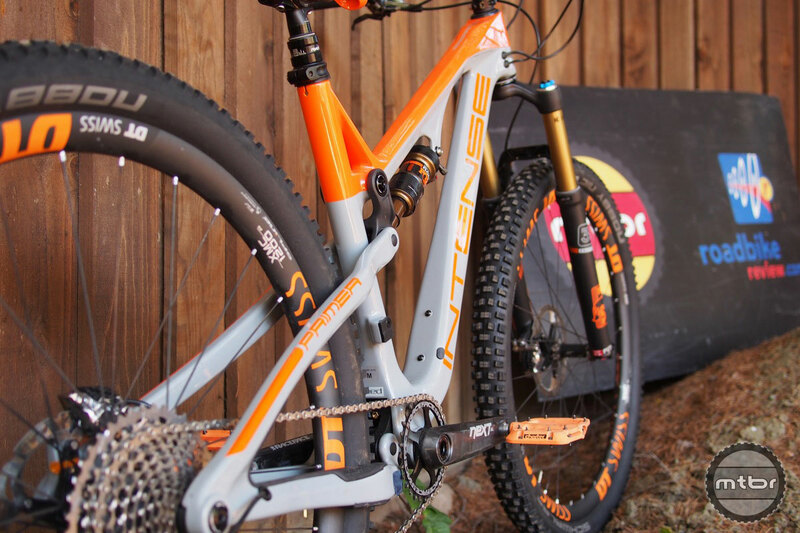 We mounted each tire tubeless and inflated them to 40 PSI. The tires then sat for 30 minutes to help account for stretch. We then deflated tires to 25 PSI before measuring. All widths were taken at the widest point of the tire. So how does the Schwalbe Nobby Nic fare? Keep reading to find out. The Schwalbe Nobby Nic is an all-around trail tire so you don’t necessarily expect to be blown away in any one performance category. But this tire achieves what it was designed for, delivering good grip and longevity, albeit at a steep price ($92). The Schwalbe Nobby Nic was a solid pairing with this Intense Primer. We do have one bone to pick with this tire, though. If you look at the tread from the side, you can see a clear path to the other side without any knobs. This gap has caused us to slip the front tire when riding in loose conditions. It’s something we look for now in most tires, as it can deliver this behavior when the rider is primarily on this part of the contact patch in slippery and at-the-limit conditions. Because of this, we prefer using this tire on the rear, and installing something like a Schwalbe Magic Mary up front. 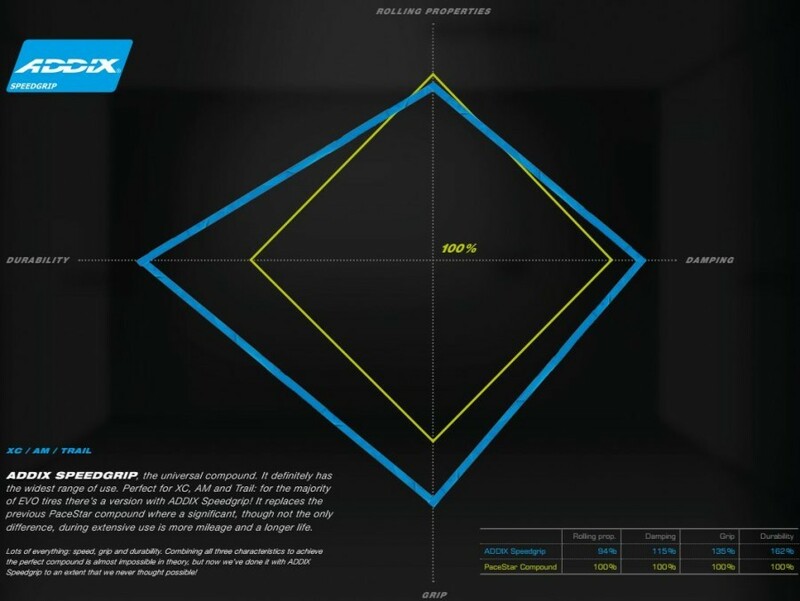 Here’s how the Addix Speedgrip compound fits into the wider realm of tire use. But with the blocky knob pattern and horizontal gap, the Schwalbe Nobby Nic delivers awesome traction on climbs. These tires are like paddles that claw up steep and loose trail. The other most notable quality is excellent and predictable braking. Couple that with stable knobs and it’s one of our favorite rear tires. 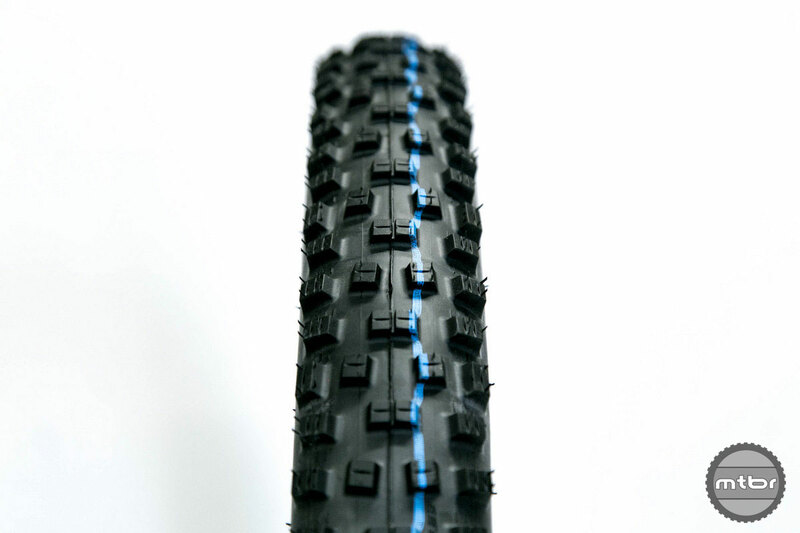 The blue stripe indicates that this Schwalbe Nobby Nic model uses the Addix Speedgrip compound. There are four Schwalbe tread compounds. We tested the most appropriate one for this bike segment, Addix Speedgrip. The Speedgrip is the most versatile in the line, and will be available on virtually every model Schwalbe offers. It’s essentially what PaceStar was, except it offers significantly improved grip and durability. Notice the horizontal gap in the tread pattern. 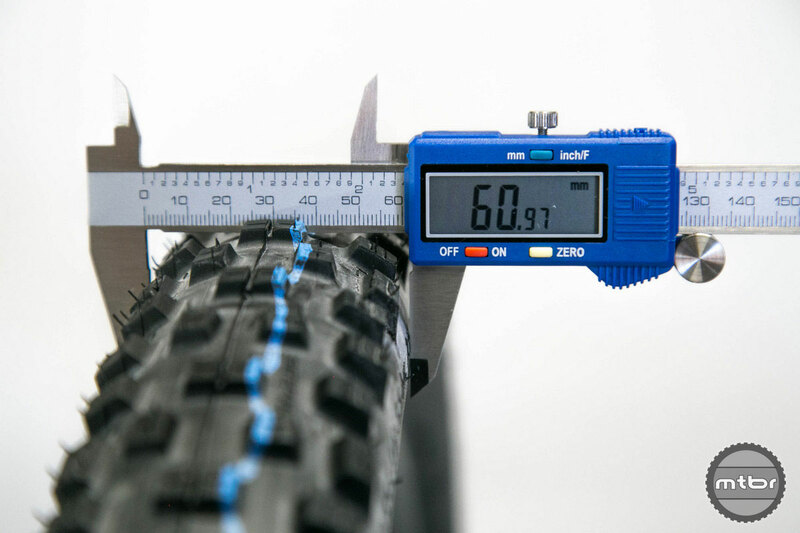 Weight wise, Schwalbe is one of the best. There are insanely light tires in the Schwalbe line, so clearly they know how to control materials. In this tire, they delivered a weight of 834 grams with good sidewall protection. That’s not light based on old standards, but considering the size and sidewall protection, this is a decent weight. It’s a very useable tire, but not one intended for weight weenies. We mounted the Schwalbe Nobby Nic to a Stan’s Arch MK3 wheelset, which has a 26mm inner rim diameter. That 60.97mm measure converts to exactly 2.4 inches. In terms of durability, the Addix Speedgrip was a true revelation. Durability has been the Achilles heel of past Schwalbe tires, but that appears to have been addressed. The Snakeskin casing is good, too, delivering good ride quality and good durability in our Tahoe and Downieville test rides. Weight is about average for this category. Bottom line, while expensive, the Schwalbe Nobby Nic is one of our favorite rear (but not front) trail tires. If it slips a little bit on the rear, it’s controllable and of little consequence. On the front, though, it can lead to trouble. But pair it with a Magic Mary front and it’s a match made in heaven. 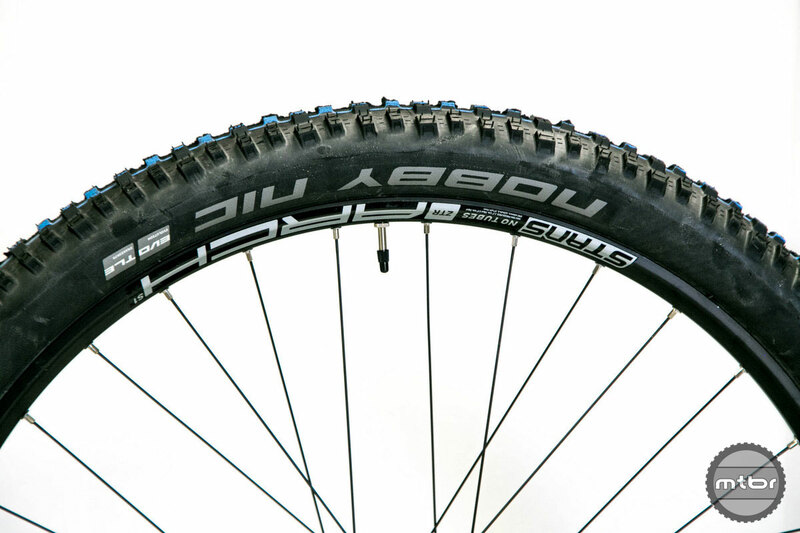 The Nobby Nic is one of the most popular tires, and is spec’d on many trail bikes. The Nobby Nic was a solid pairing with this Intense Primer. 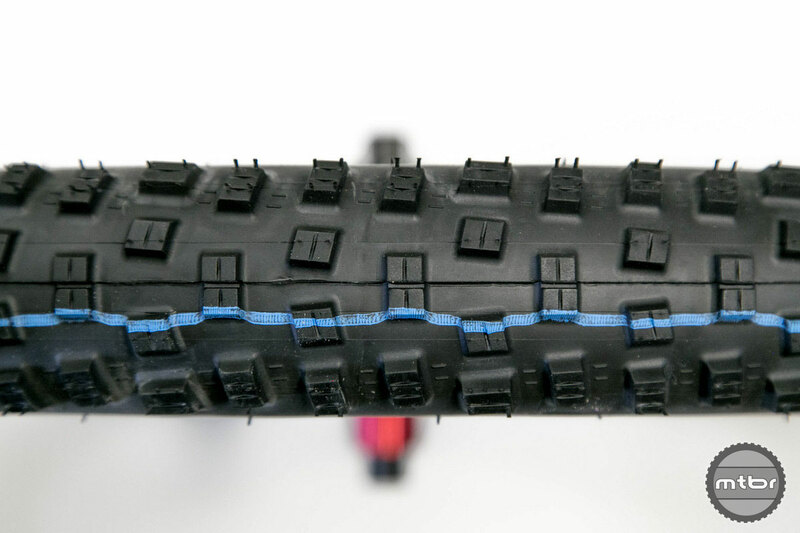 The blue stripe indicates this tire uses the Addix Speedgrip compound. We mounted the Schwalbe Nobby Nic to a Stan’s Arch MK3 wheelset, which has a 26mm inner rim diameter. The 2.35 could be sketchy on the front, but I haven’t found cornering to be a problem with the 2.6 width and the Addix Speedgrip compound. Is there a real review here? This sounds more like a marketing release. What size? On what bike? Under what conditions and use? At least show me a picture of a dirty tire, or it didn’t happen. Decent rear tire, terrible up front. Horizontal gaps? I think you mean lateral. I am riding the Magic Mary 27.5 x 2.35 up front on a 35mm inside diameter rim (Derby) with the same size Nobby Nic on the rear and it is a great combo for all kinds of riding: Sedona, loam in the PNW, dry, and wet. Really hard to top this combo for the weight and grip IMHO. Sorry we had some text drop out during editing. Measures are 29×2.35. Article has been amended. Thanks for reading. Click “read more” and the page expands to a full review with all the details. First ride 5 holes in 2 hours, but its was easy to fix. Dropped it in garbage bin, and putted back Contis Trail King apex protection.